The Rocky spin-off has Joseph Campbell written all over it. In his seminal text The Hero with a Thousand Faces, mythologist Joseph Campbell posits that foundational works of literary legend written across thousands of years have shared a basic plot structure - a cyclical separate-initate-return process that he dubbed the monomyth. Campbell suggests that heroism must be earned through a series of tests and trials that remove the subject from their comfort zone, force them to adapt to new surroundings, and provoke a rebirth before they can return home. While many find this to be an oversimplification of classical dramatic structure, Campbell's work has been embraced by the mainstream ever since George Lucas cited it as a major inspiration for his first Star Wars film. Today, Campbell's influence is evident in major motion picture franchises like the Matrix films and the Harry Potter series, and in television shows like Buffy the Vampire Slayer and Community. 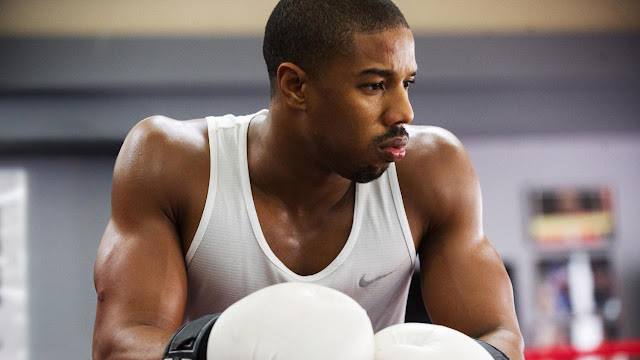 Most recently, writer/director Ryan Coogler (with co-writer Aaron Covington) uses it as template for his masterful 2015 Rocky spin-off, Creed. 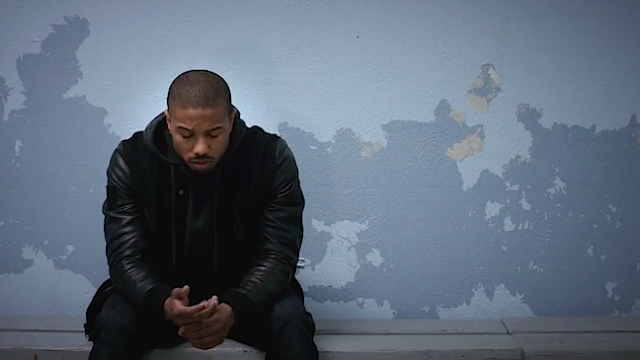 By fusing traditional mythological structure with the well-trodden sports genre film, Coogler allows his Adonis Johnson to hunt not only for professional glory in the ring, but for personal catharsis and a legacy that stretches far beyond that of his father. Campbell's cycle typically begins with a subject living below or outside of their potential, usually misguided or distracted in some form or another. This "ordinary world" nurtures the subject comfortably while simultaneously suppressing the characteristics that make them exceptional. One day, however, a discovery or change of fortune (what Campbell sometimes calls a "blunder") illuminates for the subject not only a new path, but the suppressed potential inside of them: "Blunders...are the result of suppressed desires and conflicts...The blunder may amount to the opening of a destiny" (42). 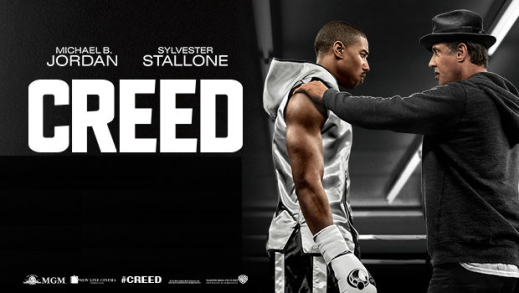 Creed's Adonis Johnson, illegitimate son of boxing legend Apollo Creed, begins his journey in the comfort of his mother's home and a safe, reliable job in the world of finance. His penchant for underground boxing, however, is stoking a inner fire that overwhelms him when he watches videos of his father's classic bouts on YouTube. * He quits his job and picks fights at the Delphi Boxing Academy, his father's old stomping grounds. But he isn't ready; he's denying his legacy ("I don't know [Creed]. Ain't got nothing to do with me") and is consistently dissuaded from boxing by his family and friends. Adonis must now make a change. By recognizing the limits of his environment, the subject takes his first step towards transformation: "[The call to adventure] signifies that destiny has summoned the hero and transferred his spiritual center of gravity from within the pale of his society to a zone unknown" (48). That zone unknown is Philadelphia, step two of his hero's journey. Next, the subject will seek (or sometimes inadvertently receive) guidance from an aged and wizened mentor figure. Often this figure will provide a talisman or some insight into the subject's true powers: "A protective figure [will provide] the adventurer with amulets against the dragon forces he is about to pass...What such a figure represents is the benign, protecting power of destiny" (57, 59). This figure lends credence to the larger importance of subject's journey and provides foundational skills and tutelage (again, the talisman) that aids in the subject's development. 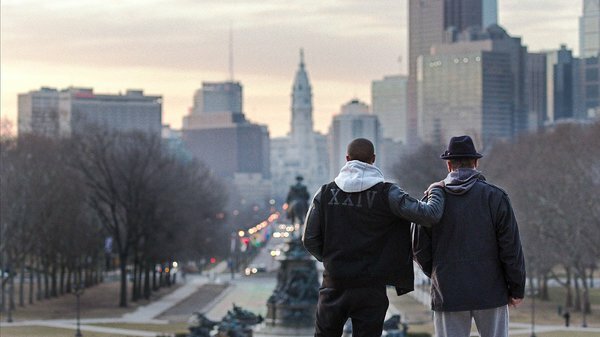 In Philadelphia, Adonis incessantly pursues and eventually receives the guidance of Rocky Balboa, his father's best friend. Not only does Rocky see Adonis' untapped potential, but he carries the scars of Apollo Creed's death and sees helping his son as a possible cure for his own inner turmoil. It's crucial that Rocky understands Adonis' total and all-consuming need for transformation because his approval is so directly connected to Creed's: Rocky represents "a promise that the peace of Paradise, which was known first within the mother womb, is not to be lost; that it supports the present and stands in the future as well as in the past (is omega as well as alpha)" (59). Furthermore, it's only by understanding Rocky's own struggle that Adonis can embrace the deeper emotional subtext of his journey. With this conflict now properly framed, Adonis can pursue his larger goals. From there, the subject will cross the first threshold into the underworld, an uncomfortable and unending space that comes with limitless dangers and uncertainty. It's also, according to Campbell, "the entrance to the zone of magnified power" (64). It's here that the subject's skills will prove useful and receive their first major tests, the safety of the familiar now far behind. After accepting an offer for an exhibition bout, Adonis moves into Rocky's home and begins training with him at the Front Street Gym. Rocky taps into the emotional core of Adonis' struggle and gives him the tools to succeed ("One step at a time, one punch at a time, one round at a time"). This is the "magnified power" that Campbell refers to in the text. Through Rocky's tutelage, Adonis goes from a raw and spirited brawler to a focused and disciplined fighter. After extensive training, he wins his fight against Sporino (the first "threshold guardian") and gains the confidence to continue his journey: "The powers that watch the boundary are dangerous; to deal with them is risky; yet for anyone with competence and courage, the danger fades" (67-68). This internal reconciliation is impossible in the subject's current state of disarray and confusion, and the mentor figure (usually male and concerned with pushing forward through a hard road of trials) is often unable to provide assistance in any meaningful way. It's in this moment of need that Campbell finds a meeting with the goddess, a powerful female entity representing either mother or lover. She provides "a mystical marriage of the triumphant hero-soul with the Queen Goddess of the World...[She] imputes to the cosmos the feminine attributes of the first, nourishing, and protecting presence" (91, 94). While the mentor offers tools and knowledge, the goddess offers love and acceptance. Bianca, mentioned earlier, has thus far been a peripheral goal and figure of support on Adonis' journey. Counseling him in his moment of weakness, however, when he confesses his fear of "taking on the name and losing, [being called] a fraud, a fake Creed," she reminds him that the Creed name is not a burden, but rather an asset and an opportunity to accept the paternal love he's been denying himself all along. Her particular wisdom and clarity comes from her struggle with deafness; she understands that her hearing loss is inevitable, so she makes and performs as much music as she can in the meantime, free of any irrational fear. She "unites the 'good' and the 'bad,' exhibiting the two modes of the remembered mother, not as personal only, but as universal" (95). Now far along their journey, the subject will meet with temptation, usually provoked by a desire for short-term power, wealth, or sexual conquest. This momentary indulgence will compromise their long-term status as the pure heroic figure. The spiral downward is long and destructive, and the subject must confront their own flawed humanity: "Generally we refuse to admit within ourselves...the fullness of that pushing, carnivorous...fever which is the very nature of the organic cell" (101). The ability to escape this self-destructive cycle signifies a true and righteous hero. After Adonis accepts Conlan's offer and embraces the safety of both his Creed name and his makeshift family unit, Rocky betrays that newfound trust when he (in response to a cancer diagnosis) insists that they aren't a real family, that it "was just in [their] heads. "^ This massive blow to Adonis' already tenuous hold on his sense of personal and spiritual identity is made even worse when he loses his temper at Bianca's gig. She later abandons him, and he falls back into the self-destructive pattern that haunted him as a child; he feels worthless, rejected, and alone. Rocky laments that Adonis is still "caught in the shadow" and unable to forgive his father's abandonment: "[E]very failure to cope with a life situation must be laid, in the end, to a restriction of consciousness. Wars and temper tantrums are the makeshifts of ignorance; regrets are illuminations come too late" (101). In the journey of a true hero, however, those illuminations come just in time and allow the subject to atone. Campbell writes, "Atonement requires an abandonment of the attachment to ego itself...One must have a faith that the father is merciful...The hero [must] open his soul beyond terror to such a degree that he will be ripe to understand how the sickening and insane tragedies of this vast and ruthless cosmos are completely validated in the majesty of Being" (110, 125). In short, the subject must rise above those mortal and egotistical limitations and become something greater than human. Adonis' exchange with the street biker, a small but significant moment, sets him on this path: "I heard you're Apollo Creed's son." Adonis' affirmative nod signifies his resolve and his re-commitment to the heroic path. He then rejoins Rocky, admits his fault and his ego, and the two then swear an oath to fight their battles together. Adonis has now successfully atoned with both his birth father and his father/mentor figure: "The hero transcends life with its peculiar blind spot and for a moment rises to a glimpse of the source. He beholds the face of the father, understands - and the two are atoned" (125). As is tradition in the Rocky series, this final moment of unity is punctuated by a cathartic training montage; Adonis runs the path laid by his predecessor, but the dirt bikers surrounding him signify an unmistakably personal and unique moment in time. After suffering a long road of trials, meeting with the goddess, and atoning with the father, the now-enlightened subject is worthy of transformation into a higher state of existence: "[T]his godlike being is a pattern of the divine state to which the human hero attains who has gone beyond the last terrors of ignorance...This is the release [of] potential within us all" (127), a state of transcendence nearly always signified by a change in uniform or appearance. 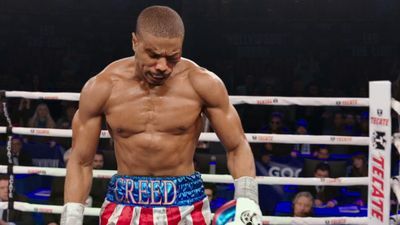 Far from home but reunited with his family, Adonis receives one last token before his final battle: the red, white, and blue trunks made famous by his father, now reading "Creed" on the front and "Johnson" on the back: "This is a supreme statement of the great paradox by which the wall of the pairs of opposites is shattered and the candidate admitted to the vision of the God" (146). Note that the Adonis we met at the film's beginning would reject this reliance on iconography of the past; he'd never felt like a Creed and was compelled to define his own path. But now that the co-existence of Creed and Johnson has been reconciled and firmly cemented in Adonis' mind, it is visually represented in a flamboyant and celebratory display of power. However, one final threshold guardian remains, and only through subduing it can the subject claim their reward: "As he crosses threshold after threshold, conquering dragon after dragon...the mind breaks the bounding sphere of the cosmos to a realization transcending all experiences of form - all symbolizations, all divinities: a realization of the ineluctable void" (163). In many myths, this guardian holds captive a magical elixir with which the subject must return in order to free his people. Twelve rounds against "Pretty" Ricky Conlan is that elixir; he guards not only the threshold to the light heavyweight championship, but, more importantly, the path out of Apollo Creed's shadow. Note that Conlan's unrestrained pride and ego is a staggering juxtaposition with Adonis' humility and deep personal investment: "I need to prove it...that I'm not a mistake." This fight is a chance for legitimacy, not only as a fighter, but as a son.^^ Adonis defies expectation and earns the respect of the victorious Conlan: "What the hero seeks...[is] not finally themselves, but their grace, i.e., the power of their sustaining substance" (168). As in Rocky, the fighter's technical loss is superseded by an spiritual and moral victory: Adonis is finally proud to be a Creed. After claiming victory and crossing the return threshold out of the underworld, the hero now lives without fear of death by evil forces. They begin applying their new skills to everyday life, solving new problems and achieving new goals: "The hero is the champion of things becoming, not of things become, because he is. He does not take apparent changelessness in time for the permanence of Being, nor is he fearful of the next moment as destroying the permanent with its change" (209). After reaching the top of the Art Museum steps (a position of royalty in the Rocky franchise), Adonis replaces his former intimidation and insecurity with limitless potential and opportunity. He is the master of two worlds, the alpha and the omega: "He no longer tries to live but willingly relaxes to whatever may come to pass in him; he becomes, that is to say, an anonymity. The Law lives in him with his unreserved consent" (205). In his prologue, Campbell writes, "Throughout the inhabited world, in all times and under every circumstance, myths of man have flourished; and they have been the living inspiration of whatever else may have appeared out of the activities of the human body and mind" (1). 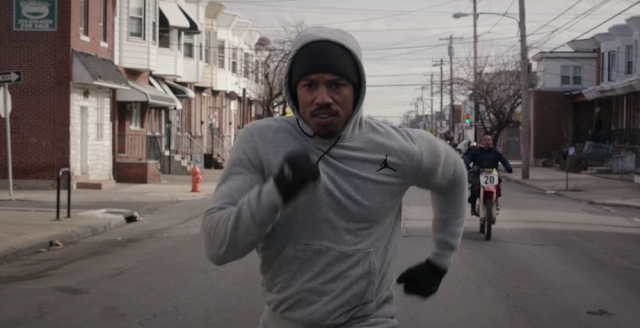 By embracing this classical monomyth structure, Ryan Coogler pushes Creed past the limits of cynical franchise spin-off and into the realm of heroic championship. Not only does he create a truly great hero in Adonis Creed, but he grants the aging Rocky Balboa grace and peace in his advancing years. It's notable that two franchises (the other being the aforementioned Star Wars) released seventh entries in 2015 that re-contextualized the exploits of the previous heroes into the stuff of myth and legend. This only reinforces Joseph Campbell's influence on modern pop culture and the enduring importance of The Hero with a Thousand Faces. Through a purer understanding of Campbell's work, we can find a clearer kinship with modern heroes and their deeply personal journeys. *Careful viewers will note that when Adonis stands to match blows in the video, he takes the place of Rocky against Apollo, hinting at the larger unresolved conflict to come. **Not only becoming, but understanding what it means to become. He must re-contextualize his father's legacy in order to pursue his own. ^Though Campbell generally cites women and money as primary temptations, Adonis is wealthy and attractive. His base mortal hangups rest more in his insecurity and abandonment issues, and thus this particular turn is much more in keeping with his character. ^^Even Rocky risks everything by allowing the fight continue when Adonis is down. But by granting Adonis his own agency, Rocky is freeing himself of the guilt he's carried since Apollo's death. Citation: Campbell, Joseph. The Hero with a Thousand Faces. Novato. New World Library, 1949.